President Muhammadu Buhari’s convoy was mobbed on Monday by an excited crowd during his visit to Kwara State for the presidential rally of the All Progressives Congress (APC) in Ilorin, the state capital. A video posted on Twitter by the Personal Assistant to the President on New Media, Bashir Ahmed, showed a mob of cheerful supporters running after Buhari’s convoy. The President had arrived at the Ilorin International Airport and was driven to the metropolitan square along Asa-Dam Road where the APC presidential rally is currently holding. 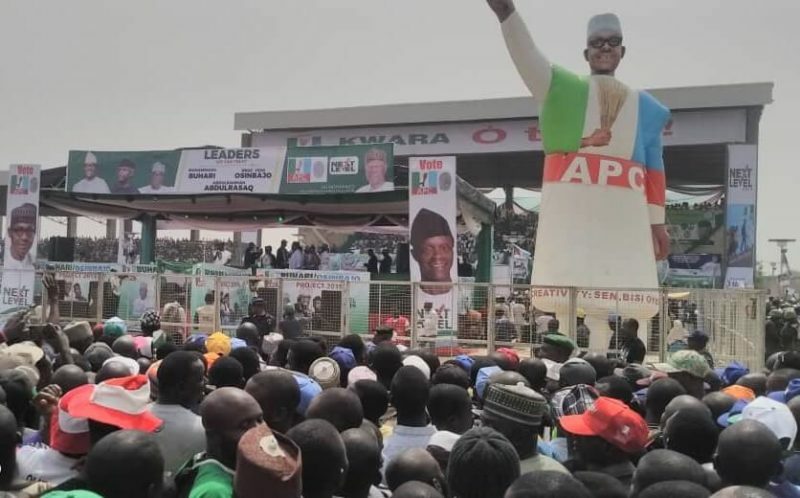 The Kwara APC rally is coming five days to Nigeria’s presidential election which comes up on February 16. Among top APC chieftains sighted at venue of the campaign rally in Kwara include the National Leader of the ruling party, Asiwaju Bola Ahmed Tinubu, APC National Chairman, Comrade Adams Oshiomhole, Minister of Information, Alhaji Lai Mohammed, and the Minister of Transportation, Hon Chibuike Rotimi Amaechi, amongst others.